Learn to spin the hoop with our new Hoola Hoop parties! Join in the fun and tone up too! Now at Platinum Pole parties we are able to offer this exciting new craze with guaranteed giggles and plenty of hip wiggles with hoola hoop parties! A blast from your childhood past, you will have fun whilst toning up without even realising it! Using adult sized weighted hula hoops, you will learn to spin the hoop on the body, before moving onto master various tricks using your arms and legs! 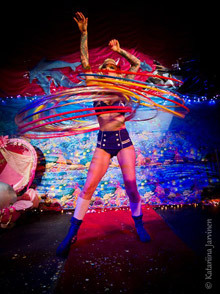 Hula hoops will be provided along with expert tuition from one of the top circus and cabaret performs in the country. You will start with a gentle warm up and then it will be time to really swing those hips inside the hoop! Only £20 per person minimum 10 people – A great fun night out!